Palawan is not only becoming a prime destination for local and foreign tourists; more and more meetings and conventions are held here, especially in the capital city. 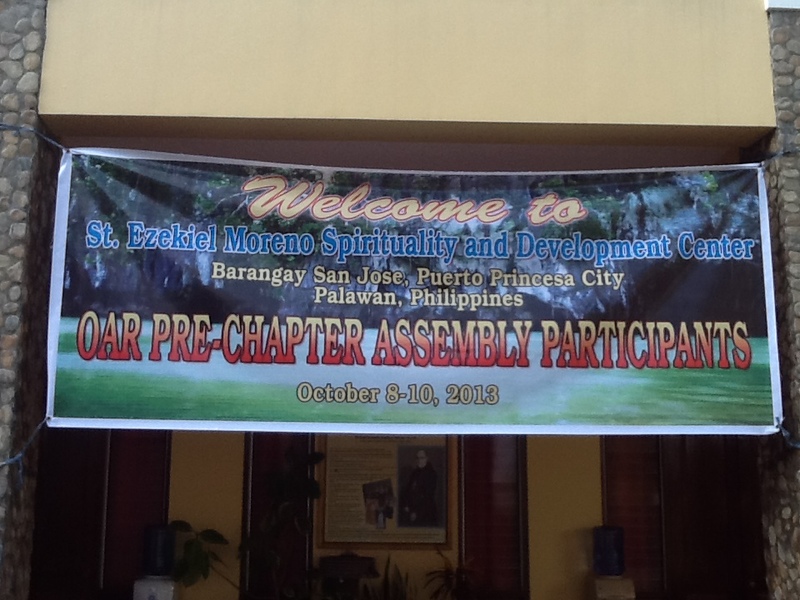 On 8-10 October, twenty-three Recollects gathered at the lush and expansive Saint Ezekiel Moreno Spirituality and Development Center in Barangay San Jose in a pre-chapter assembly. The participants – prior provincial and council, priors, commission heads – reflected on pertinent documents (papal messages, constitutional texts, previous chapter ordinances, Fr. Provincial’s communications), listened to progress reports on the implementation of 5th provincial chapter determinations, and crafted proposals for the next provincial chapter (2015). Though aware that a proper pre-capitular commission is going to be named to whom the provincial will send the suggestions or proposals considered appropriate (cf. Const 415, vi), the body took its task seriously and even tried to fine tune, within its time limits, the numerous aspirations on eleven areas affecting our life and work: spirituality, formation, education, ministerial and mission apostolate, communications, history/culture/heritage, social/ecological concerns, economy, governance and fraternal correction. Among the proposals that indicate the revitalizing mind of the participants are those that call for formulating a Recollect way of lectio divina, establishing a domus recollectionis, insisting on formation in simplicity and sobriety, reducing the number of religious in school administration posts so as to strengthen the pastoral action, and breaking the status quo type of parish administration in order “to be relevant to the current needs of the people we serve”. At the last session in the morning of 10 October, Fr. Provincial sincerely thanked the group for the breadth and depth of its work, which assembly chronicler Fr. Ernil Almayo had collated in an admirable fashion. Many participants returned to their communities in the afternoon of that day, the rest doing so in the following days. Fr. Provincial took time to make the 6-hour plus trip to and from Taytay to visit Monsignor Morito Delfin (representing Bishop Juanich, who is abroad) on October 11, and Bishop Pedro Arigo later in the day, to treat about our ongoing involvement in the two Vicariates, with a view to ensuring that it is “decidedly missionary” and at the same time dovetailing with the thrusts of the local church. As usual, the food and hospitality at the center, which is administered by Recollect sisters, have been exquisite. As if that were not enough, a superb anticipated birthday lunch was served on October 9 for Inagawan Recollect Fr. Sam Eyas (birthday October 11), with the brothers in that community and a handful of friends, parishioners, clergy and SARF members joining the assembly participants.